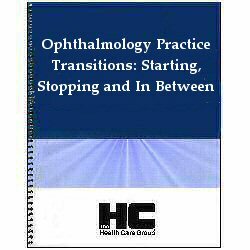 Ophthalmology Practice Transitions: Starting, Stopping and In Between is a comprehensive and in-depth reference for ophthalmologists who are facing the uncertainties and risks that confront them at key transitional stages of their careers. In today's ever-changing practice environment, the ophthalmologist must have an understanding of the professional, legal and business challenges that arise in the course of starting, growing and exiting from, a successful ophthalmic practice. This book explains and highlights key non-clinical factors underpinning a successful journey. Questions dealing with practice start-up's, expansions, phase-down's and retirement are covered in the pages that follow. Of course, ophthalmologists should seek and receive proper advice from the appropriate advisors -- attorneys, consultants, accountants and pension advisors -- and while the author recognizes that no book can substitute for specific advice, he hopes that it will give guidance for those facing new phases in their careers.